I purchased the Swirly Bird Photopolymer Bundle during the demonstrator pre order. I will admit it wasn't on my first order. I placed a second order for this set. The swirls just didn't interest me at all. Then I noticed some of the other stamps in this set. I love this little boat. This is the first card I did with this set. I just love it. 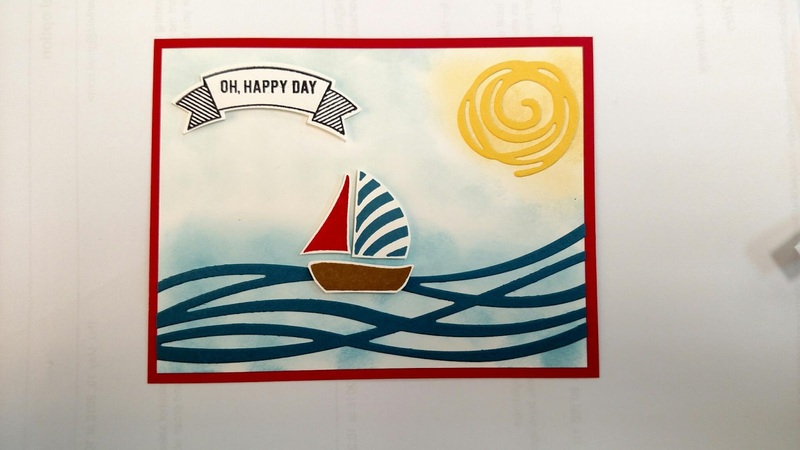 I stamped the boat pieces with Real Red, Dapper Denim (loving these new In Colors), and Soft Suede. 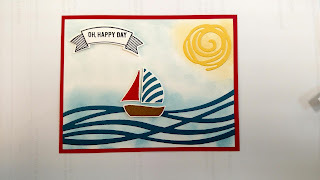 I didn't use the little flag stamp that comes with it because I fussy cut all the pieces and felt it would be too small to pop up using dimensionals. I sponged my background with Marina Mist and Soft Sky on a piece of Whisper White (5 1/4 x 4) and used Dapper Denim for my "waves" and Daffodil Delight as my "sun". I used the Thoughtful Banners for my sentiment and punched it out with the matching punch. Then it is mounted on a Real Red card base (5 1/2 x 4 1/4). Look for other cards to come.